Looking for gifts for people who work at home? We’ve got 10 top gifts for a home office with Boho flair. If you’re in the market for giftables with a more masculine vibe, take a look at this post. Wow your favorite work-from-homer with an oh-so-pretty glass and gold desk. This lovely Belham Living Lamont Computer Desk from Hayneedle boasts a trio of shelves that are both fun and functional. Bring a corner of the home office to light with the Overarching Ripple floor lamp. The acrylic shade casts light that looks like rippling water. The antique brass finish frame stretches out in a lovely swoop. 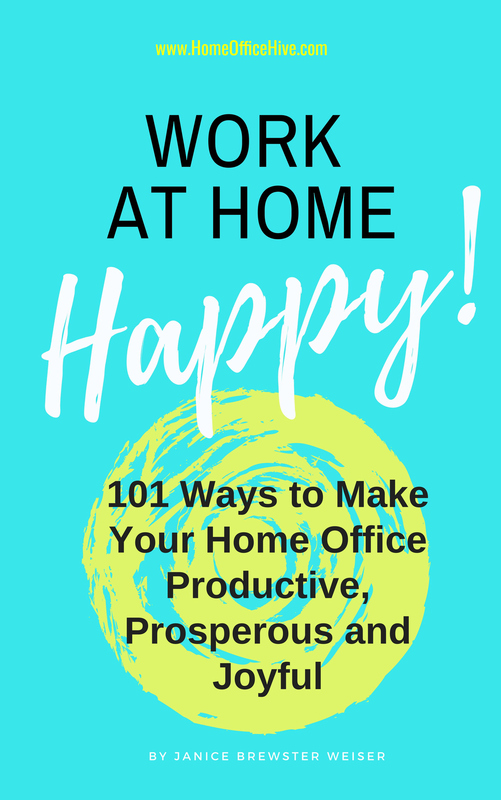 Whether they’ve worked from home forever or are just saying good-bye to cubicle life, home office dwellers will find great tips in this ebook. Work at Home Happy covers everything from office decor to productivity hacks to the best afternoon snacks. Send it to straight to your friend or loved one’s Kindle … for less than a cup of coffee. Artist Carrie Schmitt’s exuberant paintings capture the Bohemian spirit. Look for original artwork, canvas reproductions, prints and much more on her Etsy site. Really want to surprise your loved one? Book her a spot in one of Carrie’s wildly popular art workshops or retreats. Ready to spoil your favorite home office worker? The mauve velvet desk chair from World Market is comfy and hard-working. With adjustable height and five rollers, the chair makes a long day at the office feel so much better. Comes in black, too. When the home office starts to feel a bit lonely, music or a favorite podcast can help. This chubby Wonderboom speaker from Ultimate Ears brings all the sound in a cute, portable and even waterproof package. Extra points for the hanging loop that keeps it from hogging space on your desktop–and the adorable unicorn color scheme. This trio of easy-to-grow plants from The Sill would perk up any desk. For a gift that keeps on giving, purchase a plant subscription and a new plant will be delivered every month. Everyone needs a mouse pad, why not choose one with a happy design? A dream catcher, stars and crystals come together in this whimsical rubber-backed pad by Luna Gallery Designs. Boho lovers are free spirits, but work requires a bit of order. Take back the home office with help from the experts at Restoring Order. Identify priorities, set up key systems, learn to stamp out deadly paper build-up and more. This 90-minute DVD goes through the no-nonsense process step by step. Order a copy and kill the clutter. Skip the bland and boring metal file cabinets. This lidded seagrass basket from Overstock is the place to stash files in style. Wheels allow the basket to roll wherever it’s needed. Happy holidays to every home office everywhere!